Source: CICH graphic created using data adapted from Statistics Canada, 2011 Census of Population. http://www.statcan.gc.ca/tables-tableaux/sum-som/l01/cst01/demo62a-eng.htm – accessed July 18, 2017. 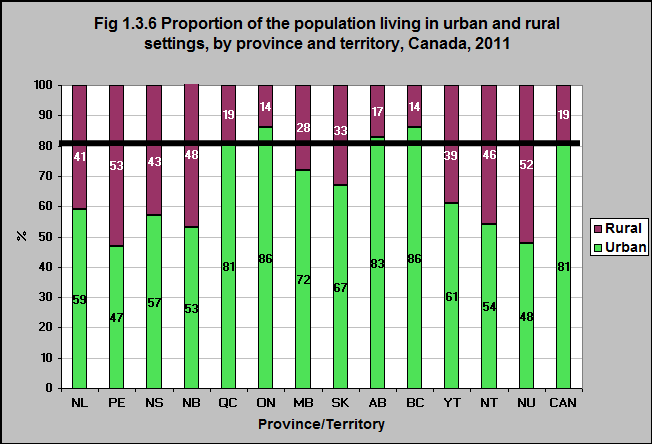 In 2011, the proportion of Canadians who lived in urban versus rural settings differed among the provinces and territories. In Ontario only 14% of the population lived in rural communities. In Prince Edward Island 53% of people lived in rural communities as did 52% in Nunavut and 48% in New Brunswick. Living in urban versus rural settings creates different experiences and benefits to young children. For example, in rural areas, children may have more access to green space – which we know is advantageous for their health and development. On the other hand, children may have more access to early child care programs and health services in urban settings.